These photos were taken at the Indianapolis Stamping Plant. All of these body parts were stamped in Indianapolis. Cool! Are those 33? Chevy? Sorry not really sure about year. GM bought this factory in 1930 and made it a truck body stamping plant... I was of the opinion these were taken about when the factory was bought. Perhaps a larger image will help. I am the plant De-Facto historian and have many images of the manufacturing processes in the Stamping and welding of Chevrolet and GMC pick up body parts in my collection. I think these are cool and would like to see more. And any info to go with the pictures if possible? They are both 34 chevy's ( easily identified by the "Maco" gills in the hood sides. The 35 was same, and the first yr of the suburban carryall, there were a few produced in 34 for the government with 1 piece stamped roofs,,,, since they had the tooling right from the beginning i never could understand why they decided to the the soft top insert---thats why those trucks didn't survive. Thanks so much for the clarification on the model year. This was right before all of these buildings were torn down and replaced with this building. The building was torn down in sections and rebuilt and the company never lost of day of production. Here is what was up an running new in 1936. In that many of my old factory images start right after WWII I am going to post them in the 1947 - 1959 Chevrolet and GMC Truck forum. Randy - I was noticing the similarity to the previous picture you posted of Chevrolet Flint Manufacturing....so much so that I thought it might be the same plant from a different vantage point. (Upon further review that's not the case). The powerhouse smokestack is what originally caught my eye. For those new to the conversation this facility is where my dad worked for 26 years. According to things I have read about Albert Kahn a book just on his accomplishments along would be in order. Albert Kahn, Architect: 1869 - 1942 was a Jewish immigrant who came with his family to Detroit in 1880. Joined the firm of Mason and Rice in 1884 where he was trained, thence was academically trained in Europe (scholarship) and returned back to the states. He boast to Henry Ford.. "Mr. Ford... I can build anything." And he did. He was the most sought after for most of the automotive industry plants. Even many in Russia. Some of his credits... Ford's Highland Park Plant, The River Rouge Complex, Willow Run Bomber Plant. Built building for Army, Navy, General Motors, University of Michigan, Hospitals, Libraries, mansions, Temples. 521 Factories alone in Soviet Union, Dodge's B-25 engine plant in Chicago. The list goes on and on. It was commonplace agreed that their is no building any better suited for the automotive industry as an Albert Kahn structure. Be it for any phase of manufacturing. It is my understanding that the Albert Kahn and Associates is still a viable architectural firm. I met a man in recent times that his father was in demolition business. He lamented that the Albert Kahn Building were the most challenging to level. Keith, For the sake of this discussion... Keith I am nearly certain that most of those GM buildings were of the Albert Kahn design. In some respect Albert pretty much had the "big three", spoiled with his quality designed, and built automotive factory buildings. 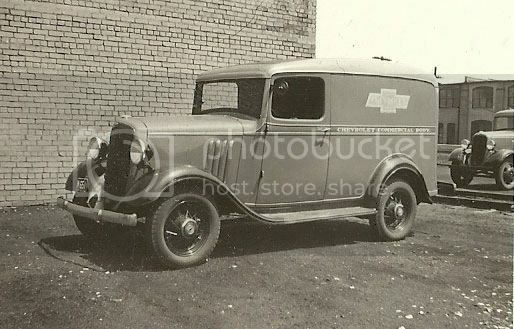 During this time period the Chevy truck cabs were made by Martin Perry - which ended up as one of GM's holding companies, and the lighter gmc ones that used cabs like the chevy were assembled by Yellow Truck and Coach -builder of all gmcs from 1924-43, the 36-8 cabs there were slight difference in the cowl side stampings between the two. And GMCs, side of the story... Alfred P Sloan's GM was notorious for whacking the inner city electric street trollies across the country--so they could install the GM yellow bus transit system, My own mother held a grudge against GM for doing this her whole life, starting about the yr she was born 32,, and would never consider buying anything GM. "“Announcement of the details was issued for the General Motors Corporation by Alfred P. Sloan Jr., President of that organization. The statement of John Hertz, President of the Yellow Cab Company, and Lehman Brothers, the bankers for the latter company, was issued through the law firm of Chadbourne, Stanchfield & Levy"
GMC's -yellow truck story starts 3/4 down this page. My alma mater, Chevrolet Flint Assembly, was originally a Fisher Body/Chevrolet combination. It merged wholly under Chevrolet a few years before I started there in 1979. There was a wall inside the building that separated the two divisions. The wall is still there....with a large pass through to facilitate truck and forklift traffic. What caused your mother to be so passionate about the trolley service (stockholder? or just an enthusiastic customer?)? Well besides the fact that she never got the opportunity to ride a electric trolly, whatever formed the memes in her head I doubt anyone could figure that one out. She was born and raised in a rural area between Houston and north tx, and grandpa moved them to Houston when she was around 12. New Orlenes and san francisco is the only places that managed to keep electric trollies that i know of. Last edited by truckeez; 07-16-2014 at 06:30 PM. Electric trolley cars on steel tracks ended in 1953 at Indianapolis. Electric trolley cars on rubber tires ended in 1958 in Indianapolis. 1919 Newspaper article about the "merger" of Parry with Martin Corp. When GM bought the Martin-Parry stamping plant in 1930 for $900,000.00 cash, prior M & P were making bodies for Ford Motor Co. as well. I always wondered if part of GM's agenda was to sort of "push Ford" out of the picture and send them scampering for a source for their truck body parts. This is the factory GM bought in 1930 for 900K. By 1935 it was torn down and replaced though. In 1913 this same factory was filled with water when White River flooded. Some nearby residence drowned in this flood. The plant was closed but eventually dried out and reopened. I for one am very grateful to you guys that have firsthand knowledge/experience with GM manufacturing. Please keep posting. Keith Seymore, I have read a lot of your posts and links and find all this history completely fascinating. Without stories such as this one history could be lost to time. Thanks guys. I would be very interested in hearing about the 67-72 assembly lines and related stories. Having parted a great number of these trucks I have some questions regarding assy line repairs and consistent inconsistencies. Thank you; my expertise starts more with the squarebodies but between SSTim and myself we could probably answer your questions or speculate as to the reason. I would encourage you to start posting them up in the 67-72 section where folks are sure to see them. Thanks for the PM G-10 about this thread. I love history lessons especially from people who lived it. 1971 Cheyenne Super Ochre/White LWB 350 Auto - my son's truck "Nancy"
I found this interesting. I’m originally from N.E. Oklahoma and after college I moved to Sherman Texas for employment and have lived in the area for the last 31 years. What rural area was you mother from? I ask because the beginning of the interurban electric (DC) trolley system in Texas actually started in the Denison/Sherman area. Here is a link to a brief history lesson of the Texas interurban railway system. I also found it interesting the automobile being blamed for the systems ultimate demise in the text as it supports your mother’s attitude of GM.